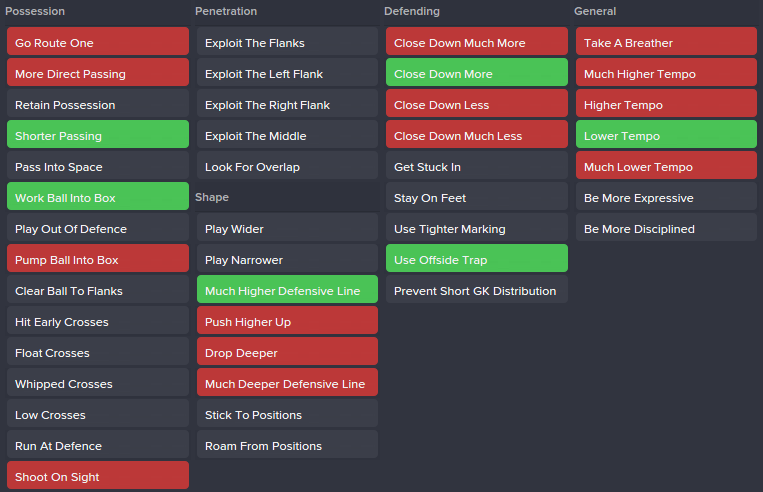 Come start a thread in the tactics forum, post up your whole team selection, roles and duties and we'll help you out. Latest update doesn't seem to have affected my tactic, still winning all my matches so that's good. Don't really notice the improvements in AI behaviour yet. No repeat of the 36 win 2 draw season though, single blip losing to Liverpool 2-0, in December now and have been winning all my other games. Difficult to tell you where to strengthen without knowing what formation you'll be playing. Central defence is always an area that will need improvement though in my opinion. Just from looking at that can see a few issues. Retain possession and pass into space are at a juxtaposition to one another. Simply having shorter passing insiutates a passing game like real life. Furthermore, I usually like to couple push higher up with an offside trap if you fancy dancing with the devil in regards to Per's lack of pace. This is my usual set up. Keeping it simple. If I want to shut up shop, I change to a below-standard mentality and add a combination of Retain Possession, be more disciplined. Depending on the tightness of the game sometimes go with stick to positions, much lower tempo, waste time, drop deeper and get rid of close down more and offside trap. A brief update on my save. Abandoned the 4-1-4-1 project pretty early on, before 10 games if I remember correctly. It just wasn't getting me results. Went straight into a 4-2-3-1 and rose to 2nd in the league, where I've remained in the wake of Chelsea's dominance. Key players are performing well for me. Walcott and Ozil when fit are fantastic. Ramsey has been the midfield maestro he showed he was last season IRL, despite his lack of goals, frequently runs the games. Ox won the Golden Boy award with his performances on the right flank and at central midfield. On the negative side, Cazorla and Wilshere have been very poor. Rarely contribute and they usually languish around the 6.5 mark every game (or lower) and results with them being hauled off! Wilshere failed to learn the LB position at all which spells the end of the Alaba-like conversion I wanted. Just continued passed the conclusion of the January Transfer window where we were moderately active. Out went Diaby and Coquelin to Fulham for a combined £5m. I plugged a number of gaps in the squad without resorting to the common players (Balanta, the Romero's etc.). I also only attempt to sign players I've never had before on any FM. In came Pedro Obiang for £6.25m from Sampdoria, he looks exactly like a young Arteta with some strength although I need to work on quickness with him. I also brought in Mateo Musacchio from Villarreal for £13.75m, he's not the world beater like Balanta or Varane, but he's solid enough to provide rotation. With the obvious weaknesses in the squad addressed I signed some luxury players. 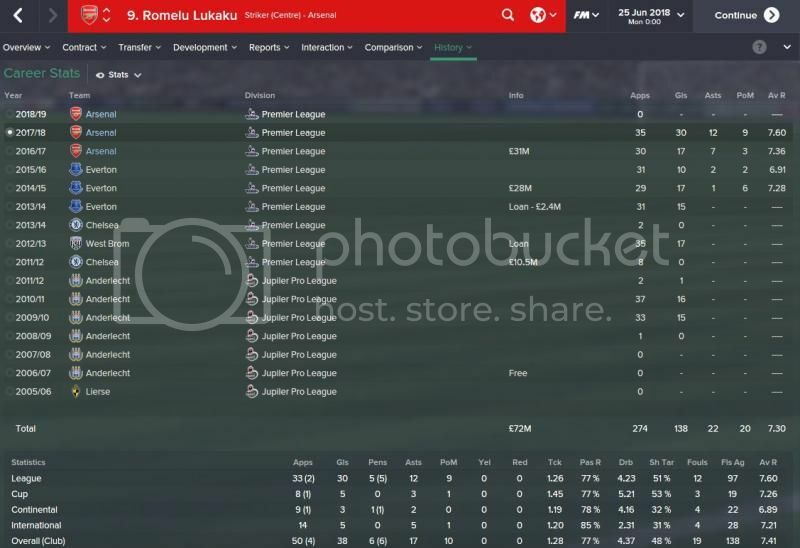 I signed a promossing defensive midfielder Llorente from Real Madrid on loan, although this comes with a £30m signing fee which is astronomical for a 17 year old, but if he develops as he should be could be a staple in front of the back four for a decade. Also signed Lucas Pratto from Velez for a deal worth £6.25m. He became fantastic on FM14 IIRC, and he's rated as one of the top players at the club. Got a shade of Tevez about him being a work house with flair, finishing and physicals of a world class player. I think I may have just had my best ever first season on FM. Started again after the latest patch. I have won every single game bar the ECL semi second leg at the Nou Camp, where Messi got a hat-trick (10-7 on Aggregate!). For whatever reason a couple of tactical tweaks and ramping up the Opposition Instructions (and of course lots of squad rotation to ensure fitness) has been incredible right from game 1. I assumed the form would drop off, but bar a few tight games (against easy opponents it has to be said) in Dec & Jan, its been largely a cakewalk. My league campaign was helped by imajor injuries to Fabregas, RVP, Rooney, Aguero and Yaya, meaning some of my most testing games have been less testing than they might. But I have never had a team on any version playing like this. Ended up EPL with 114 points and a GD of +128!!! Right from day 1 Ozil and Wellbeck were on fire (21 goals, 13 assists, 8.43 in 32 games & 36 goals, 20 assists, 8.10 in 29 games the EPL alone), and crucially both stayed fit. Walcott was equally amazing once back in the squad. Playing Ozil as a Treq may have put more pressure on the midfield, but what a difference it made. quite apart from the amazing stats above he played 222 key passes in the EPL - 140 more than anyone else. And ramping up the OI meant so many goals late on. Best results: 7-3 vs Barcelona at home (including walcott and welbeck in injury time); 8-1 vs Aston Villa at home (rare start up front for Podolski - hat trick within 27 mins; 7-0 at home vs Newcastle (4 for Welbz); 6-1 away at Swansea (3 Welbz, 2 for Ozil); 8-0 (h) vs Leicester (ozil hat-trick); 4-0 away at Man City & 5-2 at home to Chelsea. Only significant signings: Phil Jones (28.5 over 478 months the day they bought Vertonghen), Tielemans (12m over 48 months), Balanta (7.25m); Gago (2m over 48 months); Sisto 2.5m; Traore from barca (for his small release - can't rememeber) and Coentrao from Madrid in Jan for 5.75m. The rest were kids or freebies or super to allow squad rotation in cups. got 8.75 for Monreal from Sevilla and Monaco took flamini off me for 4.9, and Joel Campbell for what will add up to 26m!!! Didn't want sell him, but seeing as that paid for half my signings....flogged a few other early freebies (bandalovski, Merida, Emeghara etc for upwards of a total of 25m in Jan so now have more budget than I started with. Tielelmans - 15 games, 7 goals, 7 assists 8.24 from central midfield. Also got Odegaard to become the youngest ever EPL scorer off the bench in the final game of the season which was fun. Its the introduction of these kids (plus a few appearances for Akpom, Gnabry, Belleren, martinez etc) which will help me maintain my enthusiasm, so the likes of Cazorla, Rosicky, Giroud etc may leave this summer, or if not next. Want to keep a fairly settled squad now (along with a couple of great bosmans), unless I can pick up the likes of Pogba, Cavani etc for less than usual. As AW would say 'top, top, quality'. I also love how different a season can be from game to game. In my last one it was Giroud and Sanchez who were my best players, and I scored about 70 less goals in all competitions but had a tighter defence. This time round Utd had the lowest goals total in the top half. Falcao got 1 goal in 17 games for them!!! But then the usually hopeless Soldado got 16 as Pocchetino fell out with Adebayor. Southampton kept injury free and finished 3rd, 1 point ahead of Man City! Liverpool were wildly inconsistent swinging from great runs at the start and end of season to a complete xmas colllapse. 3 points separated 6th, 7th, 8th, 9th & 10th...with the first 3 sorted by goal difference alone. Going into the final game in Spain Real, Athletico & Barca have a point separating them. Hoffenheim won the bundesliga by a point ahead of an injury destroyed Bayern who sacked Pep. Psg & Juve owned their leagues. Nice way to win the title, beating your rivals at home and lifting the trophy infront of them! End of season update 2014/15! So here are my results for April and May. Disappointed to lose to Newcastle because I dominated the game but my league form has been excellent so can't complain to much. Here's a look at the league table. 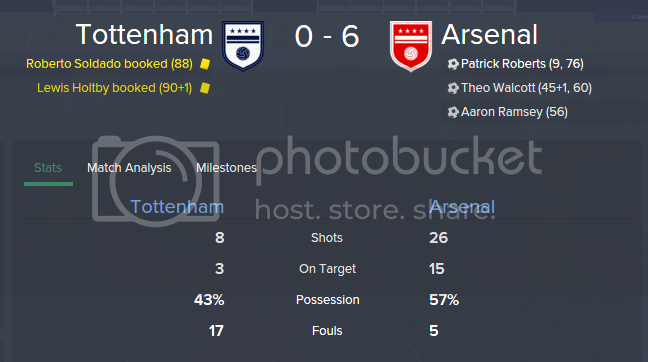 Won it comfortably in the end after Chelsea had a slump in form in their last few games. Very happy with a 95 points total. City were the big underachievers. Might see if I can nick Aguero off them now they're not in Europe. Other than that, no major surprises. May look at bringing in Jack Grealish now that Villa have gone down too! Danny Welbeck was my top scorer and netted 26 times in all competitions, but 25 of them were in the league. That was enough for him to win the top scorer in the league. He also picked up premier league player of the year with an average rating of 7.61 in the league. Jack Wilshere won premier league young player of the year having scored 7 goals and had an average rating of 7.22 in the league from a central midfield role. All of my players, even those who played a bit-part role, finished with average ratings above 7. Notable mentions go to Walcott who was awesome when he came back from injury and chipped in with 17 goals, Alexis Sanchez who chipped in with 23 goals and finally Phil Jones, who had an average rating of over 7.5 in all competitions in his first season for us. So onto the new season. Transfer-wise I'll be looking for release Diaby. Also want to sell Sanogo and Jenkinson who are not part of my plans. Will look to loan a lot of the youngsters out again to get experience. Reus will be joining soon so that'll probably be my only marquee signing unless a big name becomes available. I'm confused by the clubs' world reputation. Anyone with a clue how it works? Everton (who I think was taken over by a sugardaddy) all of a sudden leapfrog to 2nd behind Barcelona in world reputation. They haven't won any competition, their highest finish was 2nd in the Premier League 5 years ago. Meanwhile I've won 7/7 Premier League titles and 4/7 Champions League titles and Arsenal is only ranked 9th. Interesting signing here.. he did really well and got me the winner in The FA Cup Final! I had Lukaku, Sanchez & Welbeck all out and got desperate on deadline day. 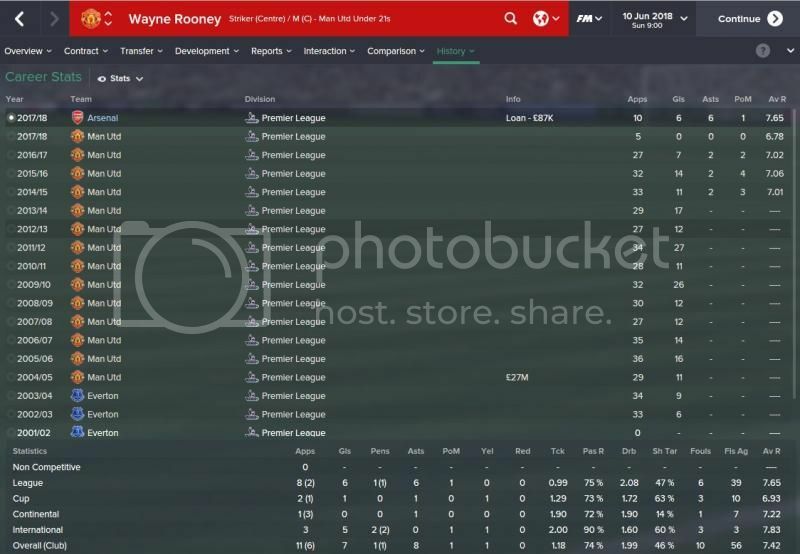 Have signed: Romero, Gomez, Stones, Meyer and Odegaard so far in my joint save with the other person being Man U. Unfortunately Koscielny broke his leg before the season even started. Not sure really if Stones, Mertesacker and Chambers is really going to be sufficient even with Monreal and Hayden covering there. Super brief "4 seasons in" report. Very consistent league form although ultimately disappointing. 4 cup wins & a Champions League runner up medal, not bad. 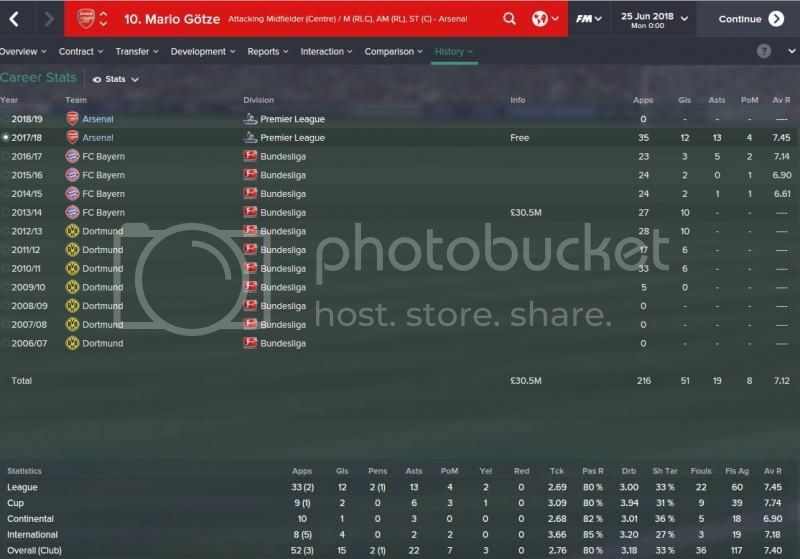 Mario Götze was superb as a Centre Mid (Attack), a lot better than I expected. Lukaku the beast, I love him. Golden Boot, Player of the Year (dedicated to me, haha), perfect Centre Forward. Season 5 coming up and am switching to a 4-4-2, Mr U Rosler's new one. Should be interesting. Annoyingly Calum Chambers started whinging about Man Utd being interested but ended up selling him for £30 mil to Barcelona. Got John Stones in as a replacement, who I'm a big fan of IRL. Start of season 3...Stepping away from The Arsenal for a while to go on a Journeyman save, won pretty much everything with them so I want to refresh my batteries a bit! Personally I would give Isaac Hayden a shout, problem solved then dude. He's decent. Or Joe Gomez from Charlton. Any thoughts about getting the best out of Giroud? I can't get him to do anything. Finished my firt season. Was very good but should be better. Ramsey was the player of the season but i think Chamberlain was better. Sanchez was out for 4 months. Until that he was the better player of the team. Welbeck played well but has that type of matches. All of you know him. And Munir. What a guy. This was the first transfer window in January. And this for the new season. So this is the team for the new season. Plus Welbeck, Savitskly and Rajkovic. 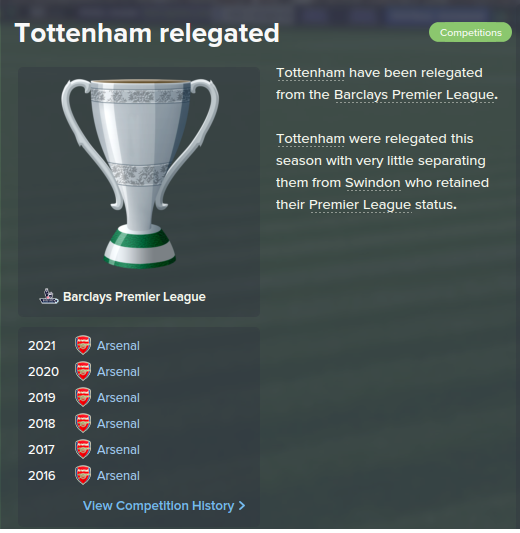 I've just come into the January transfer window in my first season with Arsenal. Throughly enjoying the game and doing well on all fronts. I had pleasent surprise when the board offered that I can change my expectations and doing so gave me a huge transfer budget of £120 million. Sergio Ramos and Cavani were bought in as luxuries realy but they add so much to my team. Is anyone else struggling offloading the likes of Giroud and Walcott? I have Destro, Wellbeck, Cavani and Sanchez up front so they are surplus to requirements. Excellent choice, best defender in the game anyway. Haha, network game? That's some nice capture for you then. My players are all unhappy with the way I treated Dedé. So now teammorale is low, and trust me, you can really feel it in the performances. Very annoying, especially since it was for no reason at all. Players are nagging way too often in this version. You can usually sell Giroud for £30m after 1 or 2 seasons, but you need to have played him. I always keep HG/English players like Walcott for the Champions League requirements. Easiest way to manage this is to just use the "I don't think you're going to get enough games etc etc at Club X", always works for me. I'm in 2021 and he's one of the best RBs in the game, glad I kept him. Ah. I offered him out for 10 mil and still no luck. I'll give him a run in the first team and see if I can get some money for him. Callum Chambers is actually coming along really well but struggling to sign a decent left back. Any suggestions anyone?? I can only assume he'll be good there, but I'm one of those who likes to play players in their natural position. I have a Bayern Munich save. Alaba is my 1st choice LB but is just as good in midfield too. I went for Davide Santon for LB, and he's been very good for me. Cheers guys. Managed to sign Santon in January for a knockdown 7 mil. Gonna try and sign Alaba in summer as he looks top notch. It's been a while since I've posted here. With uni work and an ever growing back log of games, FM was put to one side for a bit. Thought I'd get back into it now that I've got more three time. In my fifth season and after ONE league game five players have come to me about a lack of first team football?! A bug maybe? Wilshere, Bellerin, Gnabry & 2 signed players. Unhappiness over lack of first team football usually carries over from the previous season, newly signed players getting unhappy after 1 game is odd. Group of death! Uh oh, fingers crossed I can get through that. I have actually succeeded to buy Neymar from Barca. I don't exactly know how come, I did win the CL last season and was champion but it's still a mystery to me why he wanted to come. I'm close to a dreamteam right now. Also on a 41 match unbeaten streak in the league. .
Nice Ipinder. was trying to get Messi, Ronaldo or Neymar as i had 200mil Australian and finally got Neymar for 160 mil Aus (40 mil upfront and other payments). Really surprised they let him go and that he came. 16 goals and 28 assists. Not a bad debut season! Anyone else having there under 21 squad filled out with Regen's rather than under 18 players? Anyway to fix this? That's quite a big surprise idd. They actually won the championsleague in the first season in my save. They are subtop in my game at the moment. Kinda, that's why I finish seasons so fast, most of the stuff is left to my assistant manager by now, I'm more focused on signing new talents/regens in the off-season. It also helps that I'm usually only playing on my 2nd monitor while I do other stuff and not focusing on FM primarily. I'll probably start a new lower league game when I have time to focus on it. 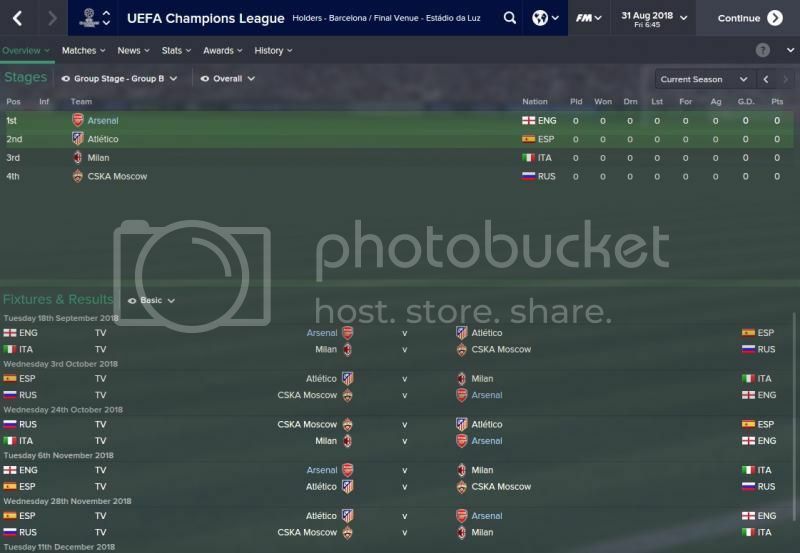 Is this just Rock Solid from Christian Eriksen's tactic thread over on FM Base? Flattered us but a very pleasing win. Especially the clean sheet. United had 6 clear cut chances to our five. Chelsea drew against Liverpool meaning we lead the table on goal difference. A very poor draw. We seemed to have done enough but Mertersacker was too slow to cope with Lukaku run and Everton earned a well earned draw at the Emirates. It wasn’t looking too good when Villa took a 3rd minute lead. Luckily they faded after and we were able to respond. Cazorla maintaining his good form keeping Ozil out of the side. We stuttered into the quarter final of the FA Cup. I named a mixed side wanting to get it done in one game. |We hit the bar three times and should’ve won by a much bigger margin. A good routine win before the first leg of the Champions league game. We had seven clear cut chances in the first half alone. An excellent start to the knockout stages. Should be comfortably through now. I played a deep line with their pacey trio of Boateng, Meyer and Draxler. However it was the clinical finishing at the other end that puts us into the quarter finals barring an embarrassment,. Only blotch was not selecting a sub keeper. Szszesny of course picked up a minor injury but had to keep on playing as I couldn’t take him off. He will now be out for two weeks. Two big horses and a little horse. Cazorla was named player of the month. Young player went to Sterling while 3 wins and a draw made me manager of the month. 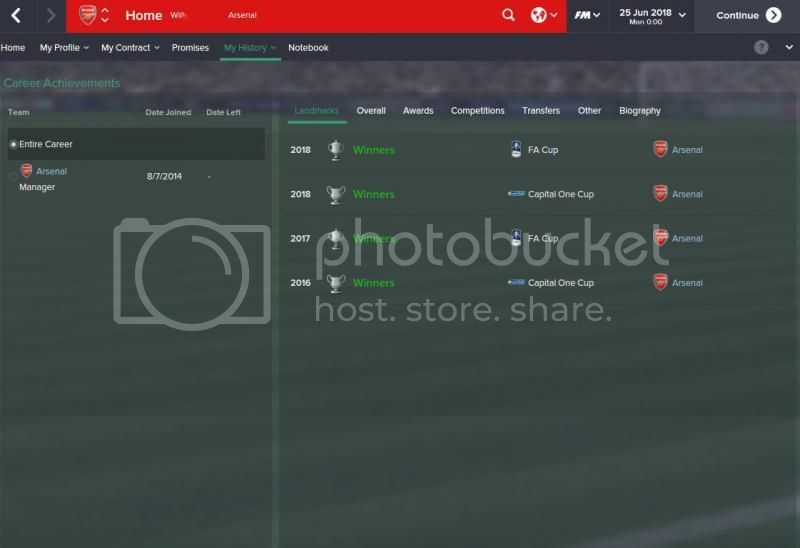 March starts with the League Cup final against Liverpool. We have 3 tricky away games in the league plus the FA Cup tie and Champions League game.